Mrs. Nerd and I are reality TV junkies. However, we don’t watch every thing out there. I was really surprised when she said she wanted to watch an episode of Duck Dynasty. Normally, her tastes don’t run to anything close to outdoors. So we watched and episode, and another episode, and another….You get the idea. We were hooked like a perch on a worm. Now one of the our favorite characters on the show is Uncle Si. I’m sure everybody has a Si in their family. Mrs Nerd says he reminds her of my dad. I can see that a bit. He has a subtle sense of humor that you have to pay attention to get all the jokes. Si is decked out head to toe in camo. He’s ready to go hunting, Jack. That said, I’ll start with the camo. It’s not the best. And it’s not the worst. On the plus side it covers everything front to back. The downside is that it isn’t the most distinct pattern. Most hunting camo tends to have leaves and branches printed on it these day. It’s also a little heavier on the grey than I would have expected. It’s more like 70’s camo done in urban colors. I believe this figure buck is used in other places in the “Adventure Wheels” line. 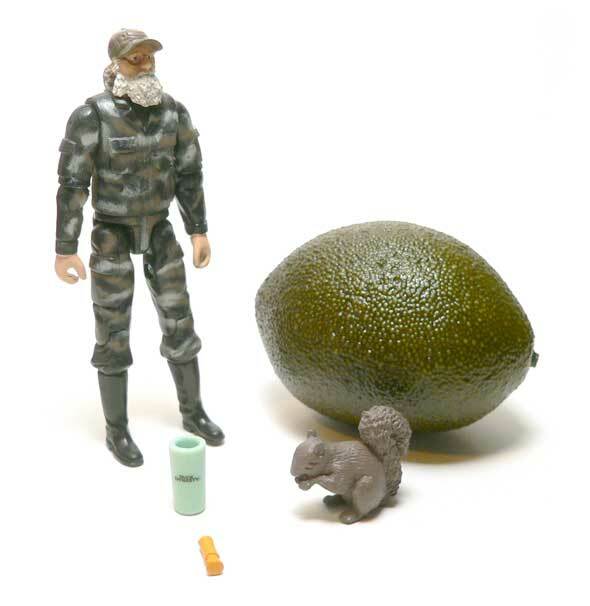 That’s the line of hunting and fishing figures Wal-Mart carries. Normally, they are in the aisle with the Hot Wheels and Cars stuff. Adventure Wheels is apparently a Wal-Mart trademark and the figures are manufactured by Treehouse Kids. I’m assuming that this means they are Wal-Mart exclusive. Any way, that line is not really high end. These figures are retailing for about $5 so I’m not going to complain a whole lot. Because of that the buck is fairly light on detail and generic. Of course, it’s not like Si and the gang have any distinctive outfits. There are some cargo pockets on the legs and arms. 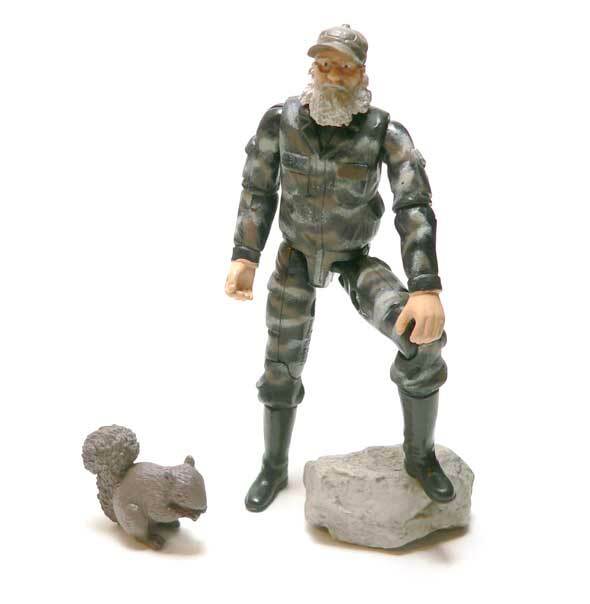 Honestly, because of the closure on the shirt and pants, it almost looks like Si might be wearing coveralls. The torso is sculpted a bit oddly. It is kind of flat on the front and back and sides. It really looks kind of blockish and flat. The thing that sets this figure apart is, of course, the head. Si always wears a ball cap and that is pretty well represented here. The thing that surprised me out of the pack was that the cap is sculpted with an opening in the back like a real ball cap has. They also included Si’s small ponytail. I was almost expecting it to be left off but it is there in a grey color like the beard. The beard looks pretty good at this scale. I just wish they had done a wash over it. I’m sure that was a cost thing. The only thing I’m really going take points off for on the head is the glasses. They essentially just painted on. Under the brim of the cap they probably work a little better than if he was hatless. I almost wish they had sculpted them solid and made them look like sunglasses. Of course, then he would have been out of place with the other three figures in the line. In an age of decreasing articulation, Si has fared okay. Knees, hips, waist shoulders, elbows and neck. 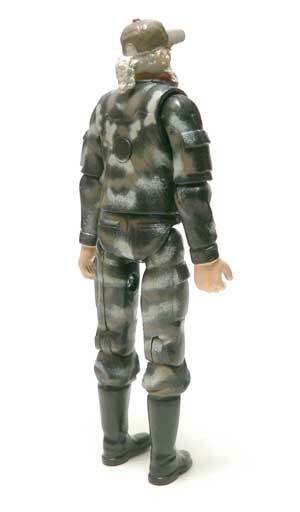 Now, this articulation isn’t as nicely done as a modern GI Joe, but he’s about half the price. I am have a bit of an issue with the elbow joints. They are either very tight or paint is sticking. I haven’t been able to get the left one to move for fear of ripping it off. The head also doesn’t want to seem to turn. 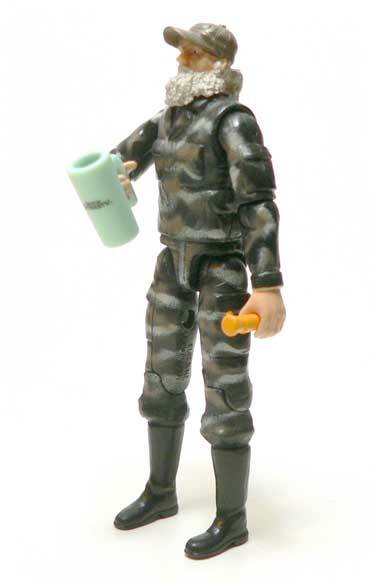 It isn’t a ball joint like your Joe figures. Heads swaps are going to be a bit more permanent and involved here. They drew upon their existing line to accessorize Si. So alas, no apron from the episode where he was sewing for Miss Kay. He does get 3 things though. 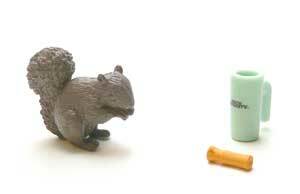 The first is a squirrel. They’ve shown Si squirrel hunting so this isn’t a bad choice. While a little bigger than he should be and paintless, I’m happy with it. The second is a duck call. 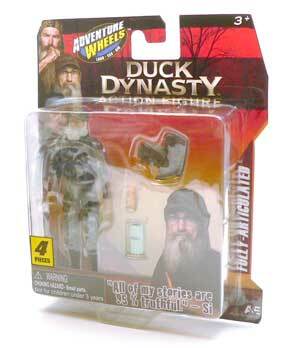 Duck Dynasty revolves around the Duck Commander business of making duck calls. The same one comes with all of the figures, but is probably somewhat essential. At this scale though, it’s pretty small and would be hard to recognize if you weren’t familiar with the show. The final item is Si’s ubiquitous plastic ice tea cup. This one has a handle so the figure can hold it. While not a perfect solution, it’s not a bad one. It let them make the cup big enough to put a Duck Dynasty logo on it. I’m not going to come out and say this is a great figure. It’s not. It’s also not $15. On top of that, it’s a pretty good representation of an average guy out hunting. Are there things that could be done better? Sure. Am I happy to have Uncle Si in my collection? You bet. And that’s a fact, Jack. Looks like an interesting concept, and the execution seems correct. I would probably get one as a generic civilian for my collection, but I just don’t watch reality TV these days, so the show tie-in doesn’t really work as an incentive for me..
Keep your eyes peeled for the next couple weeks, more of the crew to come. But, yeah they would make some great civilians.